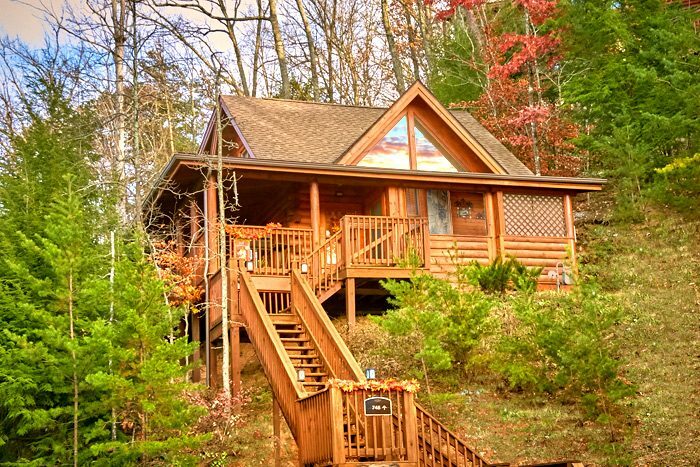 Enjoy this cabin near the Gatlinburg Golf Course with outdoor and indoor swimming pool access! "Stairway To Heaven" is a one bedroom cabin near Gatlinburg that rests next doors to the Gatlinburg Golf Course near downtown Pigeon Forge. 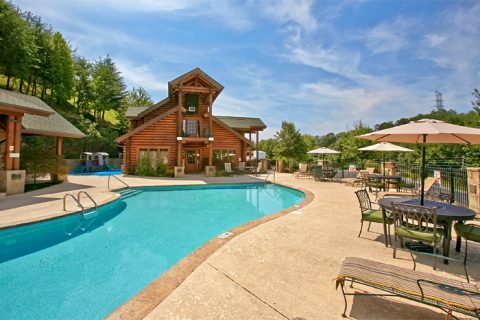 Only three blocks off the action filled Pigeon Forge Parkway and with easy access to Gatlinburg from either from the Spur or down Upper Middle Creek into the Gatlinburg Glades Arts and Crafts Community, your cabin rental near Gatlinburg with indoor pool access offers an ideal location for vacationers looking to explore the Smokies. 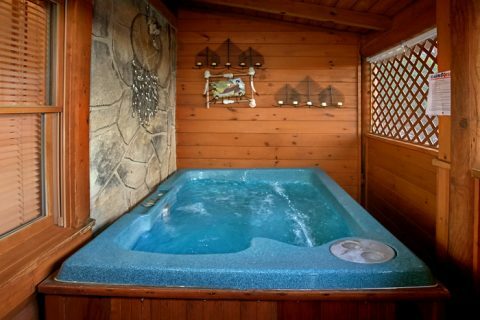 Climb the stairs to your heavenly escape and enter the world of relaxation. 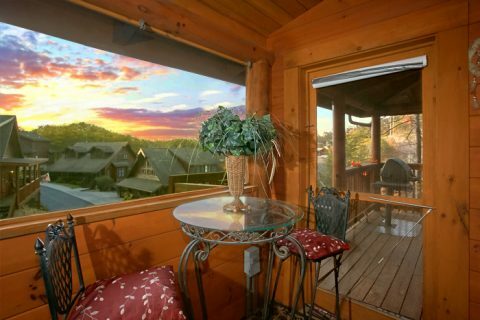 "Stairway To Heaven," unlike many of the other resort cabins Golf View Resort, is not a duplex cabin. 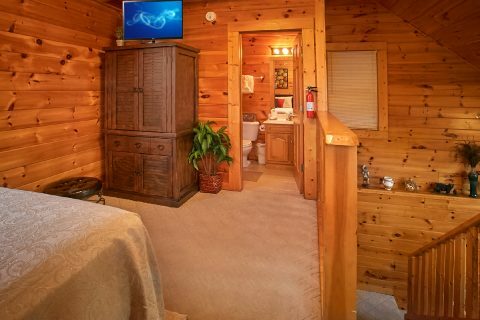 The cabin is all yours for your exciting stay. 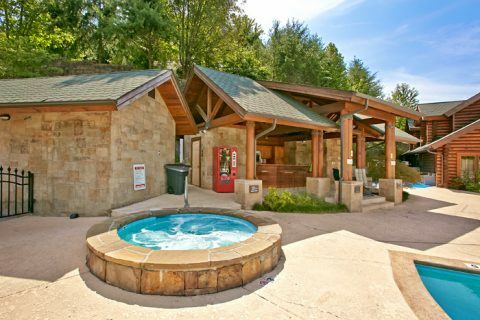 By the way, a trolley stop is located at the end of the resort's driveway and you can ride the trolley into Dollywood or take a connecting trolley all the way into Gatlinburg. 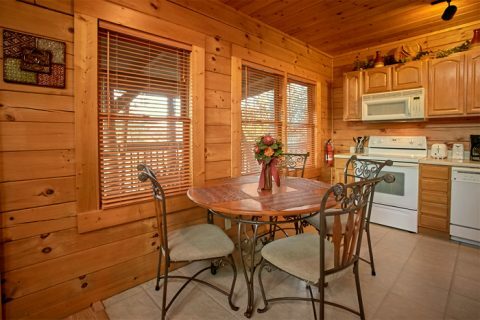 When you're not visiting nearby Dollywood or splashing in the resort's indoor and outdoor swimming pools you may like to relax in your cabin's porch screened in private with hot tub or watch NetFlix movies on your cabin's 48" Smart TV while chatting with friends over the WiFi Internet connection. 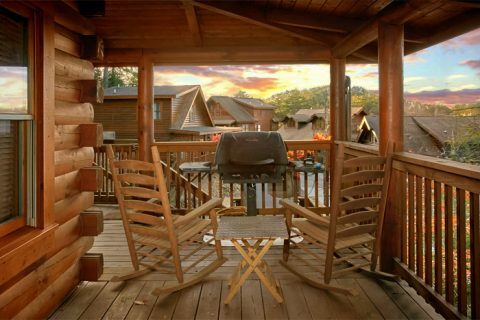 Your romantic cabin in the Tennessee Smokies offers the comforts of home and more. 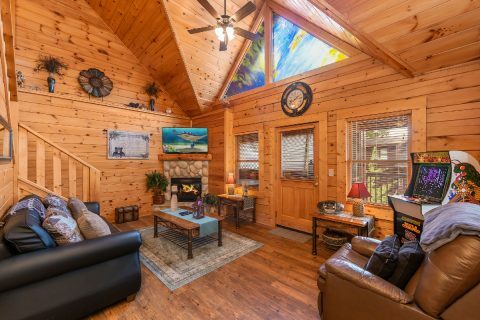 Above the living area's gas log fireplace is a large flat screen television you can enjoy. 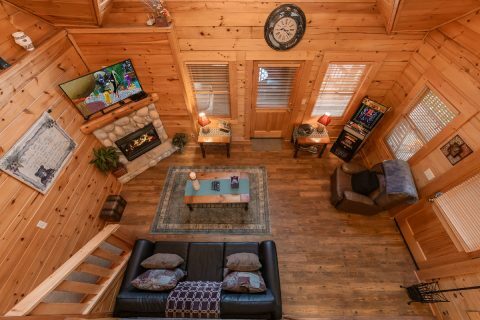 In the winter months, you may want to slide the sleeper sofa out and cuddle under the soft glow of the warm fireplace while watching a great movie. 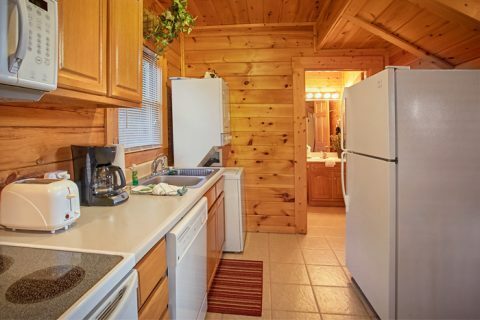 Your cabin’s cozy kitchen and gas grill are available for anytime snacks and meals for great cost savings. 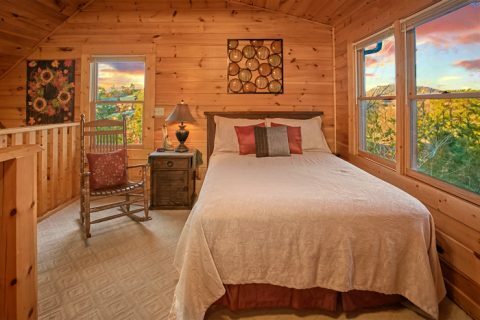 Ascend the stairs to your loft bedroom where you'll find a relaxing queen-size bed, personal television, and full bath. Love to rise early in the morning? 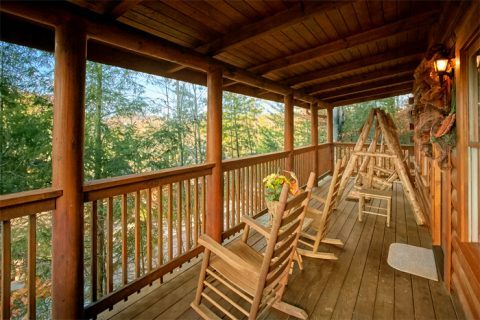 Grab your coffee and head to the front porch for a beautiful view of the mountains from your cabin's rocking chairs or the log porch swing. 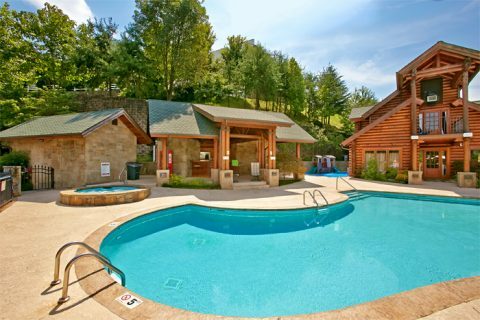 Come explore the excitement and convenience of staying in your very own cabin near Gatlinburg Golf Course with indoor pool access near Dollywood. 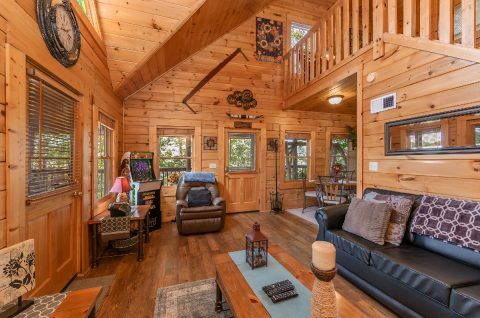 Get immediate Online Cabin Specials when you book "Stairway to Heaven" or any of our other Pigeon Forge cabin rentals ONLINE with Cabins USA Gatlinburg!